This Kitchen has all your cooking essentials. This Condo sleeps 4. Nice place to sit and take in some salt air. Shared Swimming Pool just below, with BBQ Pits. Nice place to sit and take in some salt air. Shared Swimming Pool just below, with BBQ Pits. Nice place to sit and take in some salt air. Shared Swimming Pool just below, with BBQ Pits. Nice place to sit and take in some salt air. Shared Swimming Pool just below, with BBQ Pits. TV, Futon Sofa Bed; and Queen Size Bed. This Condo Sleeps 4 with lots space. Community Shared Swimming Pool. Beautifully Decorated Condo; Queen size bed; Day bed sofa; and TV, Sleeps 4. Beautiful Shared Swimming Pool area. Kitchen with all your Cooking amenities. Full Bathroom Tub and Shower. TV, Futon Sofa Bed; and King Size Bed. This Condo Sleeps 4 with lots space. Community Shared Swimming Pool. Fridge; Small Dining Table with Bar Stools. Queen Size Bed and Futon Sleeps 4. TV; Futon Bed; Queen Size Bed as well. TV, Futon Sofa Bed; and Queen Size Bed. 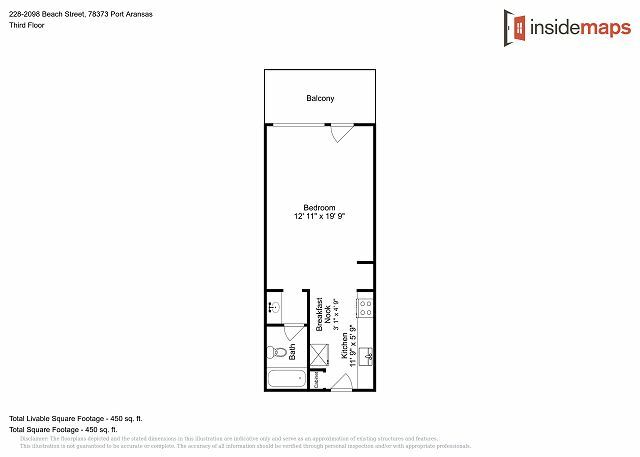 This Condo Sleeps 4 with lots space. Community Shared Swimming Pool. Queen Size Bed; Futon Sofa Bed; Sleeps 4. Bathroom next to Bedroom. Full Bathroom Shower and Bath Tub. Clean, comfortable, convenient - perfect for 2! We loved our 5 nite stay and wish we could have stayed longer! This studio unit is exactly as pictured and is perfect for a couple. It has a nice pool and hot tub, although we couldn't get the hot tub to warm up the only time we went to use it (weather was quite chilly ou 1st 2 days, so maybe a factor). Unit is on the 3rd flr and elevator not working since Hurricane, but they expect to have it fixed buy mid-summer, so be aware you'll be up & down the stairs if renting now. Payoff is a really cute & comfortable unit with nice partial view of tbe gulf & seabreezes from the deck! It had everything we needed and we enjoyed that it was so close to the beach and town with several good restuarants within walking distance! Very responsive and informative management company also. Thank you for taking the time to give us review. We are are so pleased to hear that you had a pleasant stay at this property. We apologize for the hot tub, we have it working order now. We are also excited for work to start on the elevator. We would love for you to come back and stay with us again soon! First time to stay here. I normally stay at the other end of the island in one of those **** the man resorts. However I was delighted with the sea breeze staff and condo. Check in was a breeze. A couple minor issues which were dealt with promptly and professionally. I will be back. Thank you for taking the time to give us a review. We are so happy to hear that you had a great stay. We hope you come back soon! We are so happy you enjoyed your stay! Please come again soon! The place had a great view. Clean and as described. We used the pool and hot tub and they were also clean and good condition. Great location! I didn't want to write the review so I could keep this hidden gem to my self :) Conveniently, there is a hose outside to wash the sand off of us and the dog before going inside. Thank you so much for the review. We are so glad that you enjoyed your stay with us at Sea Breeze. We hope you will come back again soon! Love Port A & Sea Breeze is a gem! We love this small complex of condos. They are always sparkling clean with comfy beds everything we need for a relaxing vacation. It's such huge bonus to find a wonderful place that allows the family pets along for vacation. It's a two minute drive to the beach or a 10 minute walk. Management is friendly and ready to help if needed. Internet could be better but that isn't what we go to the beach for anyway, so not a big deal for our family. we'll be back for many, many years to come! Thank you for the kind words. We look forward to you staying with us again in the future. Thank you for your review of SB134 glad to hear the unit was wonderful, we will make sure to correct your info on our software for the next time you come to visit. Saved money by having a full kitchen! We cooked all our meals and made the trip more affordable. Comfortable space with plenty of room. It is an older building and the elevator still doesn't work. Pool and pool area is very nice. Beautiful view of the dunes at the beach. Very short walk and drive to the Port A beach. Property management company was very friendly and super helpful. Thank you for submitting your review about SB 134, glad to hear you had a good affordable trip to Port A, the elevator is still down from the hurricane but all other amenities are in great working order as you mentioned. Let us know anytime you want to come back down to the beach and stay with us. This was our 2nd stay at Sea Breeze suites. The property has been upgraded since our last stay. The room was clean, very nice and offered everything we needed. The bed was not the best. The cleaning crew was hardworking and friendly. We particularly like this property because they allow dogs. In addition, we always look for a balcony for afternoon reading. Everything was just as described. The place was clean. The location is perfect proximity to town and the beach. Just wish elevator worked but that was not a deal breaker, and we knew ahead of time by the property listing. Had a great time our first ever vacation in Port A!